Tree care service at its best! Class 1, or fine pruning, is a detailed process in which the full tree is pruned, tip to stem. All dead limbs are removed, and branches are thinned, shaping the canopy over time. This type is the most common type of pruning for residential projects. Class 2, or general pruning, is the most common type of pruning for commercial projects. Only dead limbs are removed, so general pruning is less extensive, though does need to be performed more frequently. Class 3, also called safety pruning, concerns the removal of dangerous limbs that could pose a safety hazard in high winds, intense storms, or with the added weight of snow or ice. This service is offered for both planned and emergency removal of trees damaged through disease, decline, weather, or other reasons. Because tree removal can be complex and dangerous, it is best conducted by a professional tree service led by a certified arborist. Commercial stump grinding is conducted following the removal of a tree or trees. There are five different methods for stump grinding, and a certified arborist will help determine which is the most effective way for a particular project or situation. Commercial properties tend to be larger, with more variety of trees than residential properties, so many of the services are the same. 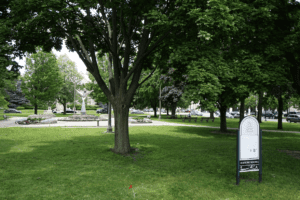 Public and government agencies want to ensure that trees and landscapes are safe, healthy, and cared for properly for the enjoyment of residents and the betterment of the community. As the exclusive contracted tree service provider for ten cities, multiple park districts, and other government agencies, Advanced Tree Care currently manages over 60 square miles of urban landscape trees and shrubs in 13 counties in two states—Illinois and Wisconsin. To enhance the beauty and ensure the safety of golf courses and cemeteries’ trees, Advanced Tree Care provides regular maintenance and care for these facilities’ treescapes. Some commercial sites require a fresh start. New construction or extensive renovation often require planting a landscape from scratch. An experienced staff can remove old, dead, diseased, or unsuitable trees and plants and design a new landscape for a site. Our programs give trees proper service and periodic care so they look their best and thrive at their healthiest. Our two primary programs are Advanced Gold and Advanced Silver. We work with our clients to determine the right fit for the budget and need. A full tree inventory creates a baseline for monitoring and caring for the health of a treescape—in the most efficient way possible. It catalogs the species and condition of a property’s trees and notes the presence of any invasive species or problematic pests. Like a plat of survey, the tree inventory notes the position of every tree on the property. Commercial projects often benefit from advanced thermal tree imaging, which uses FLIR (forward-looking resonance imaging) to analyze areas of stress not visible to the naked eye. This data allows a certified arborist to make informed decisions regarding preventive care, treatment, or removal. 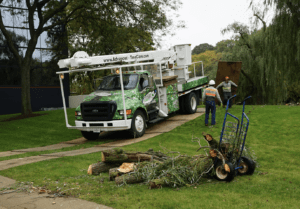 Advanced Tree Care combines top-notch equipment, cutting-edge technology, and well-trained staff to provide emergency tree removal and tree maintenance services. With a presence in nine counties and two states, we work daily to provide unparalleled customer service, safety, and efficiency—as well as the expertise to beautify your landscaping and community. Advanced Tree Care isn’t just our name—it’s also our purpose! As a homeowner, you’re responsible for the health and care of the trees on your property. That includes not only emergency care or removal but also the ongoing maintenance that keeps your trees healthy and thriving. At a detailed level, what are the various residential tree care services—and what does service entail? Simply put, regular tree pruning produces strong, healthy, and attractive trees. Trees are pruned for a variety of reasons, including for aesthetics—to create a pleasing shape—and for safety, so that weak or damaged branches don’t break off in storms. A certified arborist directs pruning, which can be conducted in most seasons for most types of trees (some species do best with pruning during dormancy). Class 1, or fine pruning, refers to a very detailed inspection in which the full tree is pruned, tip to stem. All dead limbs are removed, and branches are thinned. Fine pruning contributes to canopy shaping and is the most common type of pruning for residential projects. Class 2 is general pruning, which is a less extensive—and expensive—type of pruning for residential projects. Only dead limbs are removed. Though less costly per service, general pruning does need to be performed more frequently. Trees are removed for various reasons, including disease, decline, and damage. Because tree removal can be complex and dangerous, it is best conducted by a professional tree service led by a certified arborist. Experienced staff determine the best way to remove a tree to avoid property damage and minimize safety concerns. Stump removal is conducted after the rest of the tree has been removed. Stump grinding is the most effective form of stump removal. There are five different methods for stump grinding, and a certified arborist will help determine which is the most effective way for a particular project or situation. Some residential projects require a fresh start. New construction or extensive renovation often require planting a residential landscape from scratch. An experienced staff can remove old, dead, diseased, or unsuitable trees and plants and design a new landscape for a residential site. Our programs give trees proper service and periodic care so they look their best and thrive at their healthiest. Our two primary programs are Advanced Gold and Advanced Silver. We work with homeowners to determine the right fit for the budget and need. A full tree inventory creates a baseline for monitoring and caring for the health of your trees—in the most efficient way possible. It catalogs the species and condition of your property’s trees and notes the presence of any invasive species or problematic pests. Like a plat of survey, the tree inventory notes the position of every tree on the property. As trees grow, their structures need to be managed to preserve property safety. With the use of infrared technology, examining trees becomes a quick and cost-effective task. Areas that are not visible to the naked eye become very visible to a FLIR (forward-looking resonance imaging) system—and this information allows a certified arborist to make informed decisions regarding treatment or management. Autumn is when trees really shine, bursting out in magnificent colors. In fact, the season’s other name—fall—is for the glorious dropping of these beautiful leaves. Did you know, though, that when fall is over, and trees become dormant over the winter, they still require your care? Protecting your trees and ensuring their continued health requires essential winter tree care. Just because the warmest days of the year are behind us doesn’t mean you shouldn’t water your trees any longer. Fall can, in fact, be a dry season some years. Water your trees throughout the fall and early winter until the ground fully freezes. In our area, this can be as late as the end of December. Newly planted or young trees that still have a small root mass especially need continued watering. And, when it comes to watering, go for low and slow so that you deliver the water directly down to the tree’s root zone. How often and how long you should water depends on tree species, soil type, and our weather conditions. You can check the soil and your tree’s foliage to determine if your tree is over- or under-watered, or you can consult one of our experts. Before the intense winter weather gets here, it’s important to protect your trees so they thrive in the growing season. Before the heavy snows and ice arrive, mulch around each tree with wood chips, bark, or other organic material. You should apply two to four inches of mulch spread over the top of the entire root zone. The mulch will insulate against temperature extremes while also nourishing the soil and preserving moisture levels. 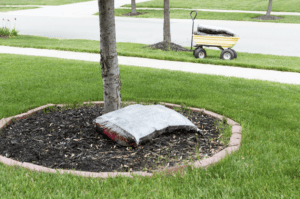 Be sure to keep the mulch layer at least three inches away from the base of the tree trunk to allow the tree to properly breathe. While stakes or ties can provide some stability for newly established trees, these items should be removed before winter. Trees will establish more quickly and develop stronger trunk and root tissue without these aids. Winter can be an optimal time for pruning because trees are dormant. In fact, pruning can help reduce the chance that a winter snowstorm or ice storm will damage your tree. Be sure to engage a professional tree service to prune your trees, so that the tree is properly cared for. Pruning cuts should be left uncovered, and proper pruning cuts should be made just outside the branch collar. Winters can be harsh on your tree. But preparing them for extreme winter weather can help ensure that they stay healthy all year round. November marks the boundary between fall and winter, and the weather certainly proves it. While it might be mild and sunny one day, it could snow the next. With real Chicago-style winter on the way, it’s the right time of the season to familiarize yourself with a winter tree care checklist. After all, you want to protect your trees, which provide so much benefit to your yard. Trees buffer strong winds, provide shade in summer, give your home curb appeal, and serve as homes to all sorts of small animals and insects. And, tree removal can be costly and complex, so it’s important to care for your trees properly during each season. To reduce the chance of limb damage during winter’s snow and ice storms, it’s important to have your trees pruned in the late fall or early winter. Trees are dormant now, so it’s a good time to prune. And, pruning can take care of weak or damaged branches or V-shaped crotches, weak areas that might otherwise snap under added weight or stress. While pruning will protect most established and mature trees, young or newly planted trees might benefit from some additional protection during winter’s harsh weather. Consider a windbreak, wrapping, or other protection. Consult a professional tree service for the best options. 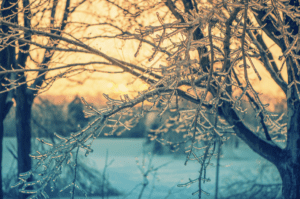 Bracing your trees can provide added protection against damage from winter storms. In addition, cabling or bracing branches over a sidewalk, driveway, or street might guard against a falling branch that could damage a car or hurt a pedestrian. Although dormant, trees do require hydration and nutrition during the winter. Be sure to water your trees and apply an organic fertilizer as needed before winter gets truly underway. In addition, you might consider the application of mulch to protect and insulate root systems from ice, snow, and salt. Speaking of salt, many trees along parkways get an overdose of salt from plows and road salting trucks. Be sure to clear excess snow away from these trees’ trunks and roots so that, when the snow melts, your tree isn’t absorbing so much salt. A professional tree service led by a certified arborist can help you ensure your trees are properly cared for each winter. That way, they’ll be able to bring beauty, shade, and majesty when spring and summer roll around again.